This is a guaranteed legal Sperm Whale tooth which is registered with the Department of Commerce as number 21-0000-185. It weighs 119 grams. The Hawk's Head is carved in three dimensions, all the way around. The eyes are the finest taxidermy glass eyes. The tooth is 4 inches in a straight line from bottom to top, and 1 1/2 inches wide. It is, of course, signed by M.M. Cohen. 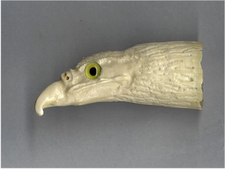 This superbly carved tooth would be a welcome and unique addition to any scrimshaw collection. Please note that, to comply with federal regulations, our scrimshawed Sperm Whale teeth can be shipped only within the United States.